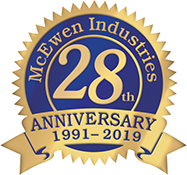 McEwen Industries is a family owned company that has been a leader in the swimming pool industry since 1991. Our success is rooted in our passion to consistently provide the very best in quality and value through your local professional pool and spa retailer. Our specialties include inground pool liners, above ground pool liners, safety covers, in ground pools, above ground pools and spas. All of our products are custom designed and meticulously crafted to ensure years of carefree use. We pride ourselves on providing legendary service and our ability to meet the custom demands of every family. Our family name is on our company and we offer complete customer satisfaction. We only trade through established and reputable pool and spa dealers nationwide, who provide the highest level of service and customer satisfaction. Your McEwen Pool Dealer will assist you in all the stages of your purchase, from selection to offering professional installation and service. With their support, you will find the perfect product for your home, budget and backyard oasis!